If you are using a Samsung mobile this will be the best tip you receive that about the Samsung Odin download for the flashing process of your Android device. This application has abilities to flash Stock ROM, Custom ROM, Recovery file, Kernels and also Root package. If you need to flash the Android smartphone or the tablet PC for beat the boot loop, app crash and application related errors this guide will show you how to use Odin download tool to make this task easy. The flashing procedure is somewhat critical and a hard one but most available of Samsung firmware may encourage you to engage with this process as well. Samsung Odin tool download can flash the Root package of the system to gain administrative privileges and make you the super user of the smartphone. Once you gain admin access it helps you to access all the files and data of the mobile operating system. Granting the administrative access may be some danger experience for average users because one wrong move will cause to brick your Android device forever. So if you need to gain root access using this tool take a perfect knowledge about Android system otherwise you will face unexpected matters. Unlike the stock ROM the custom firmware flashing has prohibited by Samsung company due to security issues and if you admit with this process it will void the warranty of the smartphone or the tablet PC. Use of this flash tool can repair all the soft bricked smart devices using stock firmware flashing manner. Frequently all the Android smartphone vendors allow flashing the stock firmware because it needs to perform when the smartphone report errors all the time. You have a great opportunity to download this tool using the following direct download links for free of charge. The flash tool has created by Samsung meant to be used only in their service centers. Actually, we are able to download Samsung Odin leaked version of the official application. That is why it may not cause any issue after the flash process of the smart Android device. You have to use a Windows personal computer to use this application because there is no any file that compatible with other operating systems. Make sure you have installed the Samsung USB drivers and they are in up to date condition before connecting the Samsung device to the computer. If not you are able to download and install them using the following direct links that added for your comfort. So let a take look at further details and the way of flashing using this tool. You can download Samsung Odin 3.12.7 and later versions using the following direct download links. There are some recommended versions have especially noted for your support. Though there is no any matter with all the Android OS updates these editions have specialized compatibility of each Android operating system versions. The latest update is v3.12.7 and this version is compatible with the latest Android Nougat. So you can flash all the firmware files using this tool as well. Samsung Galaxy Smartphone or tablet device. Samsung stock firmware. You can download it from our firmware directory. 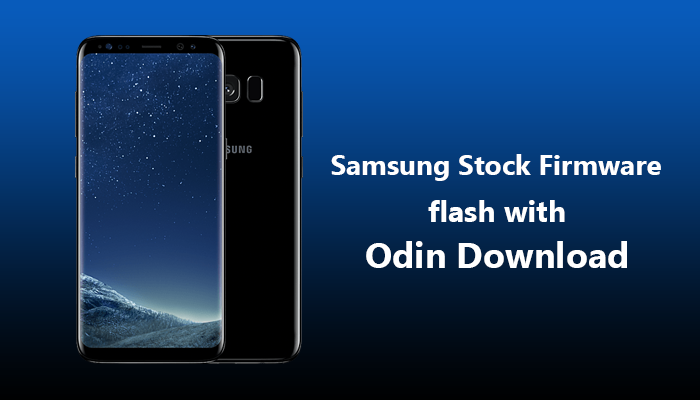 Odin flash tool is designed only for the Samsung mobile devices. If you are trying to flash another device using this application it may cause to unexpected errors of the Android smart handset. Note that, this tutorial guides you through a common procedure and no any device specialized so you have to use this at your own risk. You have to take a perfect backup of all the personal data before you engaging with this flashing process because all the data may remove during the flashing procedure definitely. After a window appears with a yellow triangular warning mark, press the "Volume Up" key to navigate to Odin Download mode. Then the window will change to another one that displaying "Downloading" and "Do not turn off target!!" text. Click on "PDA" or "AP" button. This will depend on the application version you download. After selecting the firmware file select "Start" button to continue the procedure. Do not disconnect or operate your smart device while process. After successful flashing manner, this tool will display you a green color button as "Reset" or "Pass". This message may depend on your application version. Custom Firmware Flash can be done using this Odin application. Be careful with this firmware because flashing custom firmware may void your device's warranty always. Samsung Odin is the best and only tool that can flash all the areas of the smart device and there is no any issue will arise after using the flash tool because this is a leaked version from the official. There are no any special other guidelines should follow fo ruse this application. Simply open the software, load tar or MD5 file and click the start button. It is that simple but makes sure you have downloaded the best compatible firmware with your smart mobile Android device. Otherwise, it will cause to bricked your device until you flash with the correct firmware using Samsung Odin tool.